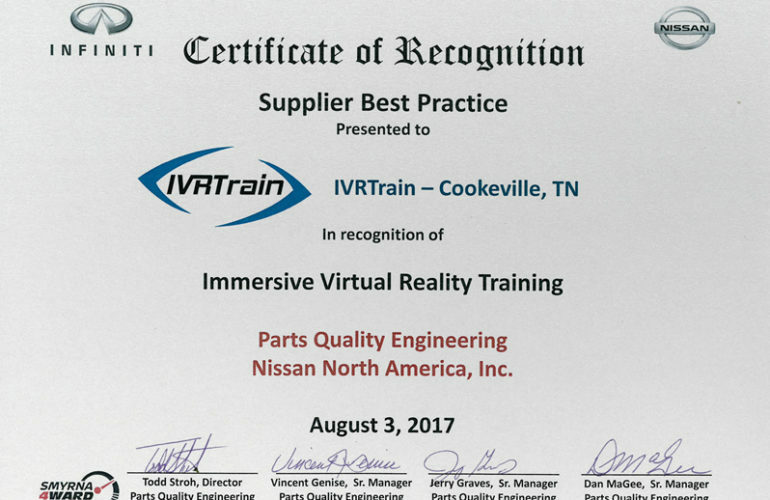 IVRTrain presented at the Nissan Parts Quality Engineering conference in August and was honored to get a certificate of recognition for supplier best practices. Nissan has been extremely supportive of new innovative concepts such as the products offered by IVRTrain. IVRTrain has worked with Calsonic Kansei to create a custom simulation for a production work cell within the Nissan Smyrna facility. IVRTrain’s virtual reality technology offers many potential benefits to manufacturing companies one of which is to provide the ability to walk through a plant layout and make changes to the layout and visualize and get a true perspective of the ergonomic and practical aspects of the layout changes. IVRTrain believes that virtual and augmented reality will alter the engineering landscape in the years to come and become one of the main components of design and engineering.